Many immigration attorneys have a great number of items that they would add to this list of grievances. For starters, Mr. Sessions also called us “dirty immigration lawyers.” While it takes a lot more than name-calling to draw the ire of seasoned attorneys, Mr. Sessions’ attempts to “speed up” deportations by imposing onerous requirements on immigration judges were maddening in their intent and ineffective in their result. Because all of the immigration judges are part of the Department of Justice, they are led by the Attorney General. While he was head of the DOJ, Mr. Sessions sought to curtail the independence of the immigration judge corps by instituting “case completion goals,” which increased the pressure upon judges to make life-and-death decisions at a faster clip. Mr. Sessions also narrowed the ability of judge to manage their own dockets by eliminating administrative closure and restricting the use of continuances. Rather than producing fair decisions at an efficient pace, Mr. Sessions’ micromanagement of the immigration judge corps created longer delays and more backlog. Mr. Sessions also sought to single-handedly upend years of asylum law development by stating that domestic violence or gang violence claims will not qualify for relief. While I expect that the Matter of A-B- decision will be reviewed (and overturned or limited) by the courts, the immediate effect is that some immigration judges may use the decision as cover for rapidly disposing of asylum claims. 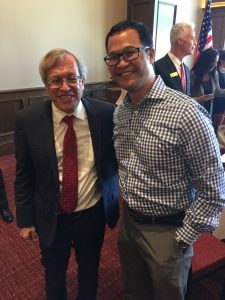 Dean Chemerinsky concluded his piece by stating “I never imagined I would say this, but we might come to find we miss Jeff Sessions as attorney general.” If the next Attorney General is even more antagonistic towards immigrants, I might be inclined to agree, but let’s wait and see. In the meantime, if you want to meet with an attorney who isn’t afraid to get a little dirty, please contact us.